Bein Inn Hotel, Glenfarg, Glenfarg PH2 9PY, Scotland. Find the best deal, compare prices and read what other travelers have to say at TripAdvisor. Balvaird Castle in Perthshire was a symbol of feudal times and is well worth seeing. It sits about three miles from Glenfarg, not far from the Fair City of Perth. From its elevated position it commands an excellent view over the Eden valley and the Lomonds. It used to belong to the Murrays, who figure so largely in history, then became the property of the Earl of Mansfield, the lineal descendant of that ancient house, and is now managed by Historic Scotland. At one time it must have been a splendid baronial pile, as well as a place of considerable strength and importance. Even yet it is in a fair state of preservation. There is no date on the building, but there are the remains of several coats of arms, almost wholly obliterated, on different parts of it, from which the date may be gathered. Above the door which opens into the principal building from the courtyard is a shield, on which two coats of arms are emblazoned. They are very indistinct, but they appear to be those of Margaret Barclay and her husband, Sir Andrew Murray. And if this be the case, the building must have been erected in the reign of James IV., about the end of the fifteenth century. It is first mentioned on a document dated 1507. On the first floor above is the great hall, measuring 31 feet by 18 feet. Over the staircase tower there is a peculiar watch-turret, from which a large tract of the surrounding country is visible. It will he noticed that some buildings of a more recent date, 1567, have been added to the castle. The name " Balvaird " is Celtic, signifying " The town of the Bard." This means that long before the castle was erected the spot was the residence of the old Druidical Bard, the poet laureate of his tribe. Here, on this identical eminence, when writing was unknown, the Bard sang of the deeds of the neighbouring heroes, their prowess in battle, their loves, and their romances. Here he helped to mould the Celtic language and to develop the national sentiment. I neither know, nor care to know. By chance to that old castle fared. To that old castle of Ba'vaird. And scaled the battlement--when lo! In their strong castle of Ba'vaird !" 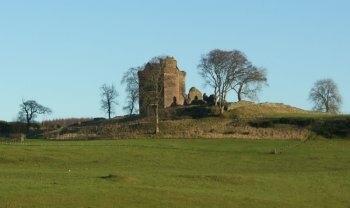 Situated between Gateside and Bridge of Earn within Perth and Kinross, the L-shaped tower house of Balvaird Castle sits atop an exposed ridge, overlooking Glen Farg. The Murrays of Balvaird were the forebears of the family which eventually acquired the titles of Lord Balvaird, Viscount Stormont and Earl of Mansfield. The castle underwent extensive alterations and additions in 1567 were made when the courtyard buildings were significantly added to. The Murray family left this castle in favour of Scone in 1685 and although it served as accommodation for farm workers, the sophisticated buildings had fallen into disrepair by 1845. Acquired by Historic Scotland in 1974, it has been restored to its former glory.